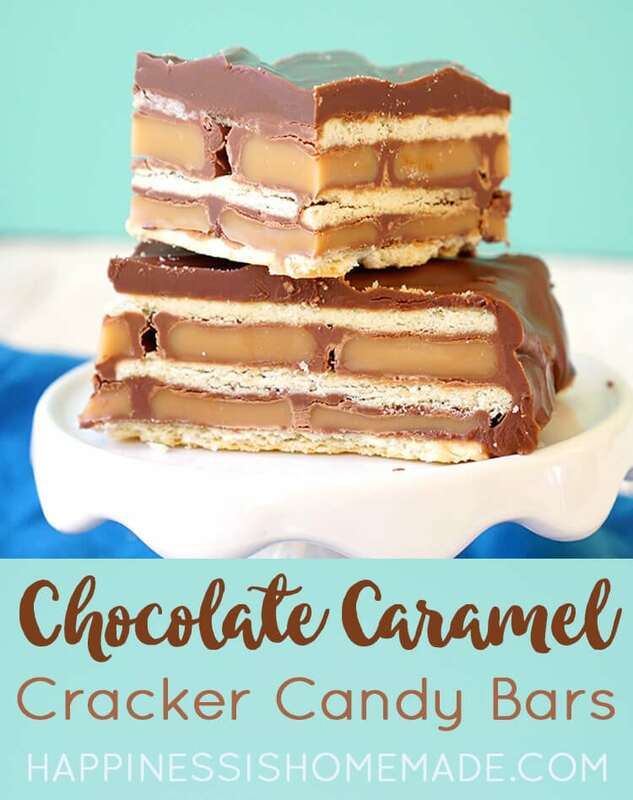 These rich and decadent caramel chocolate cracker candy bars use only three ingredients, and they taste AMAZING! Super easy to make and totally addictive! Summer is quickly coming to an end, and I officially have back-to-school on the brain. I’m trying to cram as much fun as I can into our last few weeks before homeschool begins again, but I have to admit that I have been a bit preoccupied. My mind is spinning with things like lesson planning, curriculum ordering, and the 900 zillion other things that I still need to get done…and I also can’t stop thinking about team USA starting the competition in Rio this week! I love, love, LOVE watching women’s gymnastics! Everywhere I look, I see reminders of the upcoming sporting events! 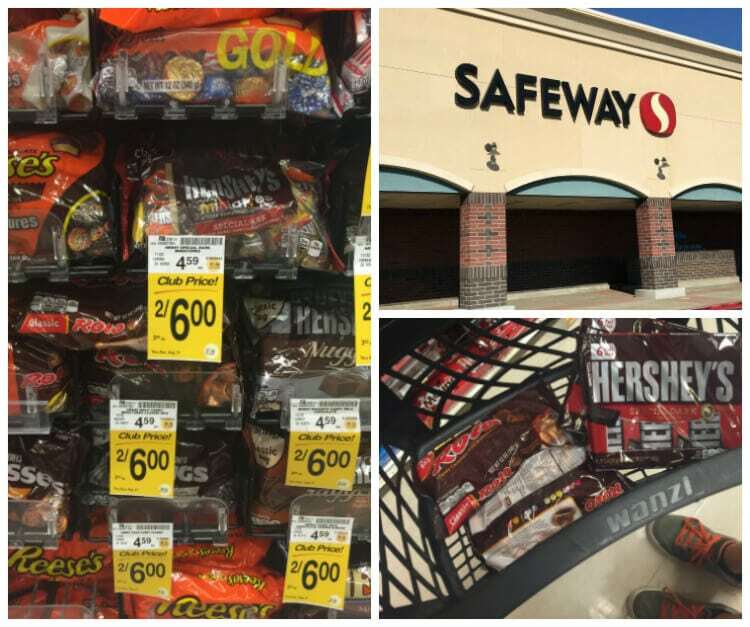 The other day while we were grocery shopping at Safeway, I noticed that lots of our favorite Hershey’s candy were on sale as part of the #GetReadyForGold promotion and sweepstakes. 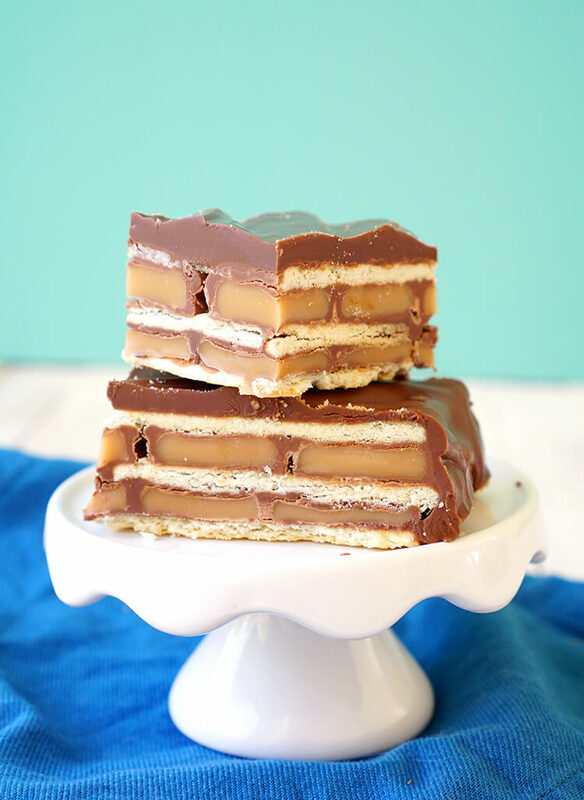 I’ve been daydreaming about creating my own version of a cracker toffee bar, so I picked up some supplies for this super easy recipe. 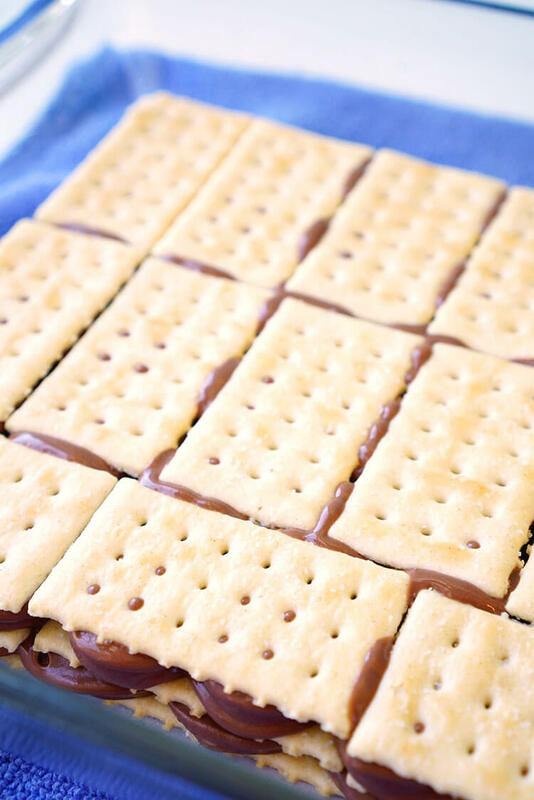 To make caramel chocolate cracker candy bars, you only need three ingredients: Hershey’s Milk Chocolate Bars, Rolos, and Original Club Crackers. You’ll also need an 8×8 baking pan and a sheet of parchment paper to line the bottom of the pan. Start by placing a layer of Club Crackers on the bottom of the pan. Top the Club Crackers with a layer of Rolo chocolates (I used 36 for mine), and if you have kids, hang on to those shiny wrappers! 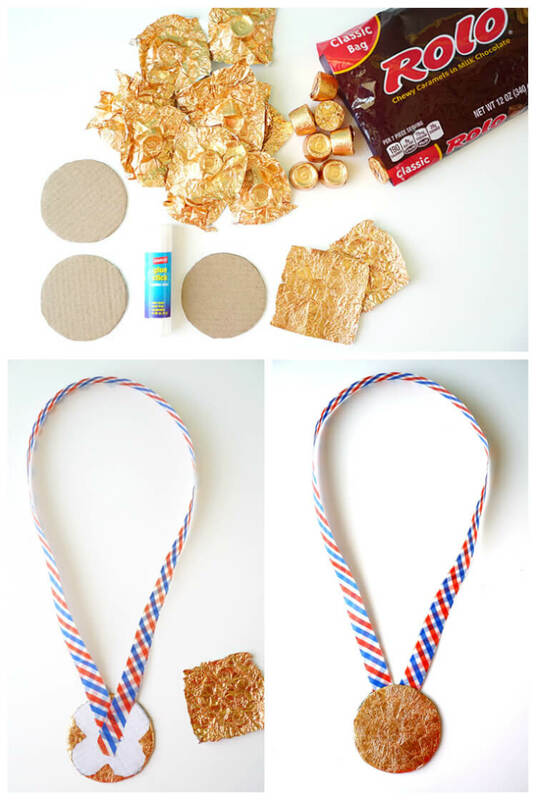 We’ll be making a quick and easy kids craft with them later on at the end of this post! 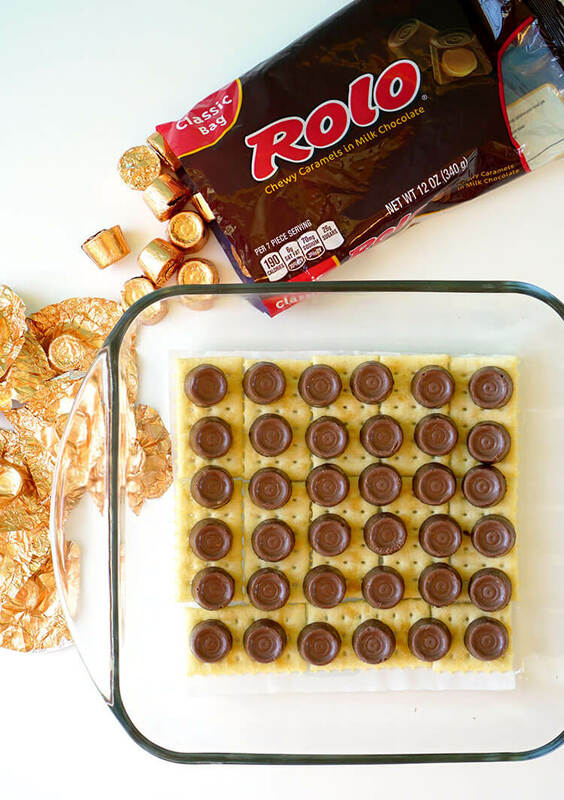 Put the pan into a 275-degree oven for 3-5 minutes until the Rolo chocolates are soft and melty. Top the melted chocolates with another layer of Club Crackers, pressing the cracker down firmly into the soft chocolates below. 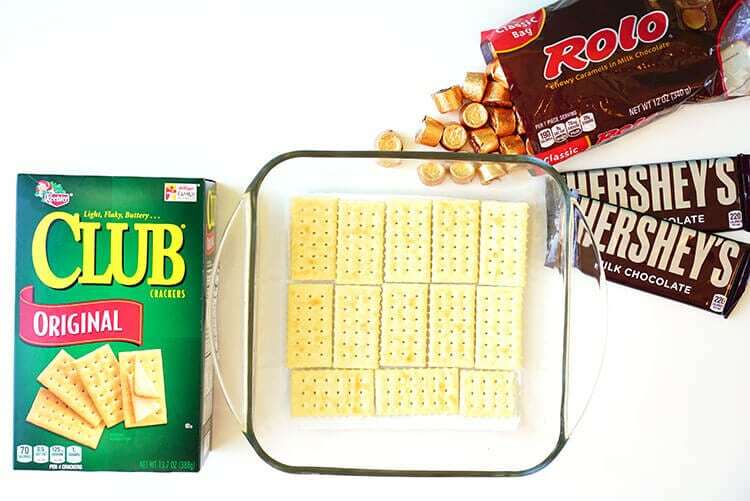 Top the Club Crackers with more Rolos, and return to the oven for an additional 3-5 minutes. 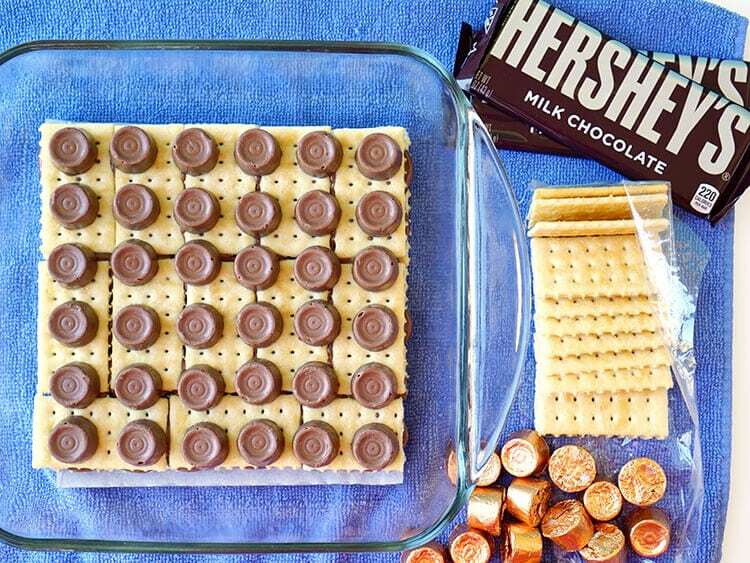 Add a third layer of Club Crackers on top of the melted Rolos. 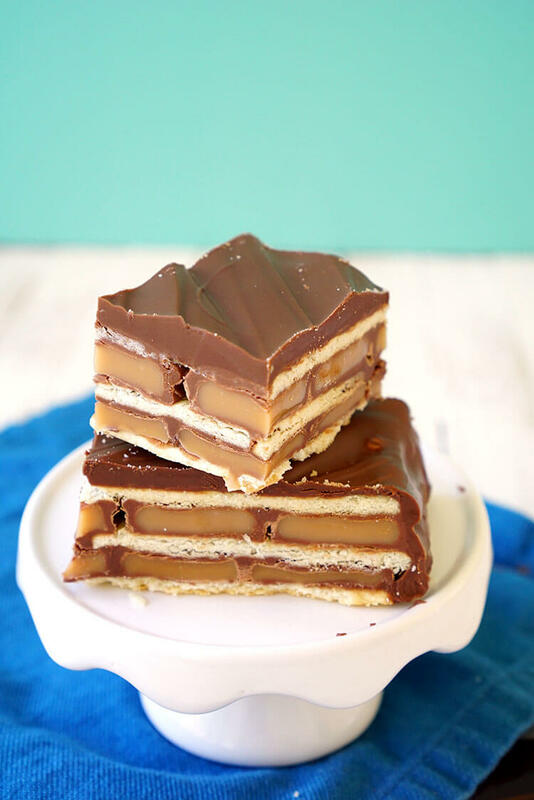 Again, press the crackers down firmly so that the melted chocolates underneath spread out to create a solid layer of chocolate and caramel. 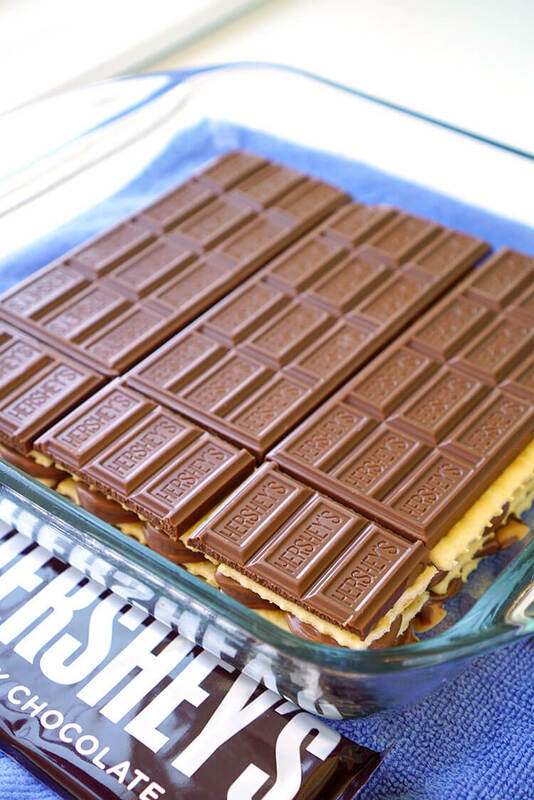 For the final layer, top the crackers with Hershey’s Milk Chocolate bars, and return to the oven for a few minutes until the chocolate bars have melted. 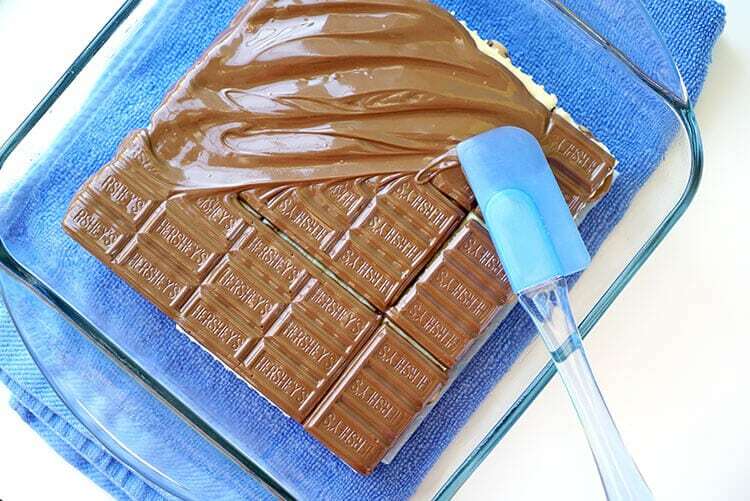 Spread the melted chocolate, and place the bars in the refrigerator for 30-60 minutes to cool and firm. 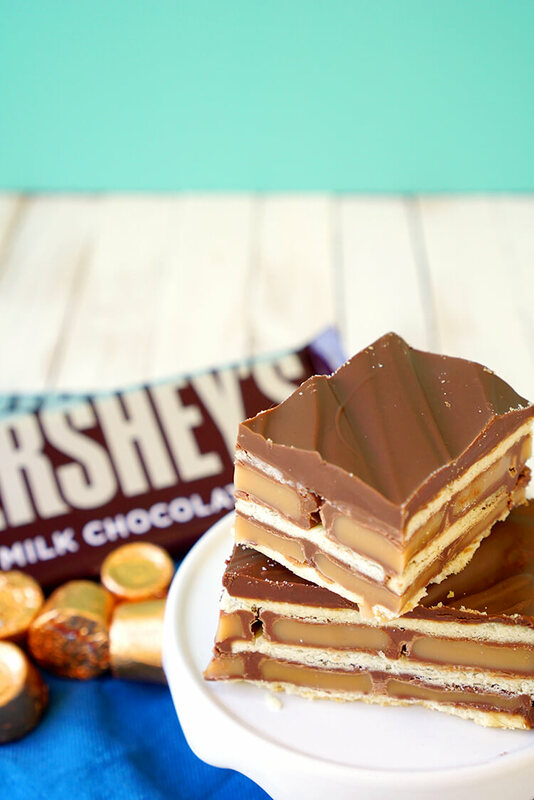 Slice into individual bars, and dive in! 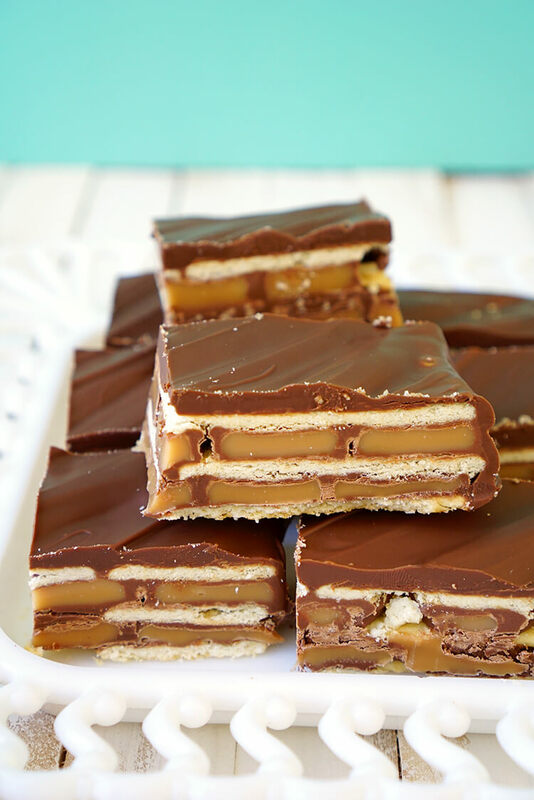 You won’t even believe how incredibly amazing these chocolate caramel candy bars are! The texture of these bars reminds me a lot of s’mores with a soft crunch from the crackers plus smooth creamy caramel and rich chocolate. YUM! Crispy, gooey, smooth, and decadent! These highly addictive bars would make a great homemade gift idea, too! I know what we’ll be giving to our friends and neighbors for the holidays this year! My kids dubbed these “Gold Medal Cracker Candy Bars” because they’re convinced that they’d take first prize in any contest. I thought it was such a cute name (and totally apropos since the competition in Rio is just around the corner!) that I decided to take it one step further, and I invited them to create their own gold medals using the leftover candy wrappers! 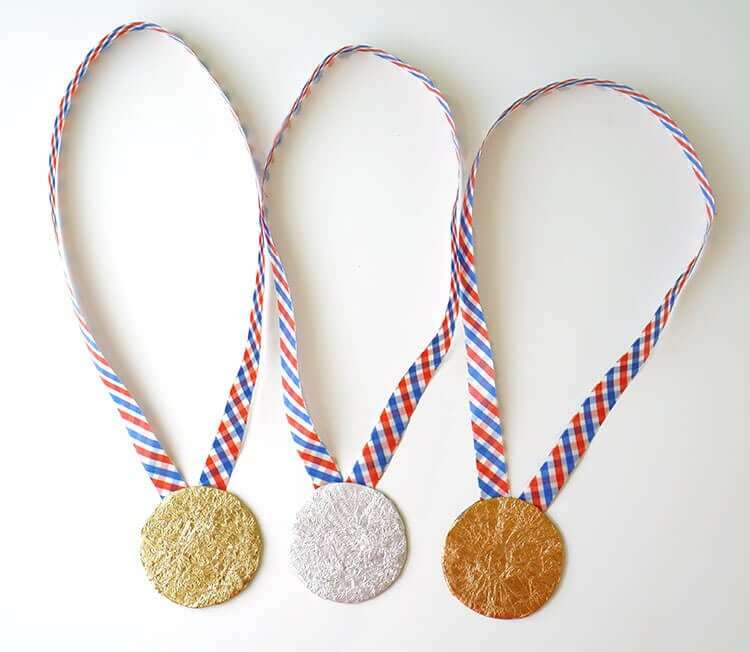 We used a glue stick, cardboard circles, washi tape, and the leftover candy wrappers to create these fun medals. Cover the cardboard circle with a wrapper, using the glue stick to adhere it. 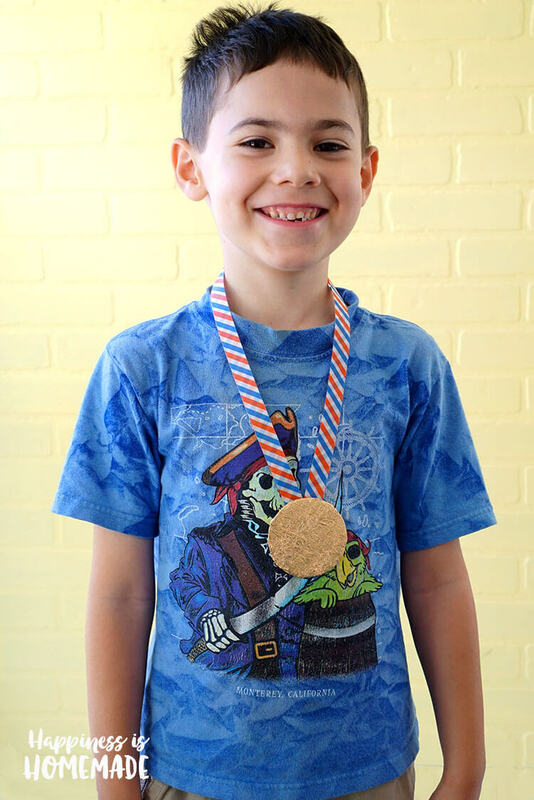 Add a ribbon made from a dual layer of washi tape, and cover the back side of the medal with another wrapper. Trim any excess foil wrapper if needed. The Rolo wrappers are double sided (silver and copper), so they made great silver and bronze medals, and we used wrappers from Hershey’s Kisses with Almonds for the gold medals. Easy peasy! This guy knows how to #GetReadyForGold! We’re really looking forward to cheering on our country in just a few days – go team! If you’re also excited about the upcoming games, check out Safeway’s #GetReadyForGold promotion and sweepstakes! 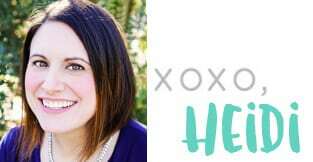 They are currently running a promotion where if you buy $50 in participating products, you can save $10 on your next shopping trip (yay!). Purchase any of these participating products before August 22nd and upload your receipt by 11:59PM EST on September 5th to the #GetReadyForGold Sweepstakes website to be entered for a chance to win a U.S. Olympic Training Camp Experience or one of several other prizes (check out the prizes and full rules here). What would you do if you won a trip to the U.S. Olympic Training Camp Experience? Although I have been compensated for this post, all opinions are my own.